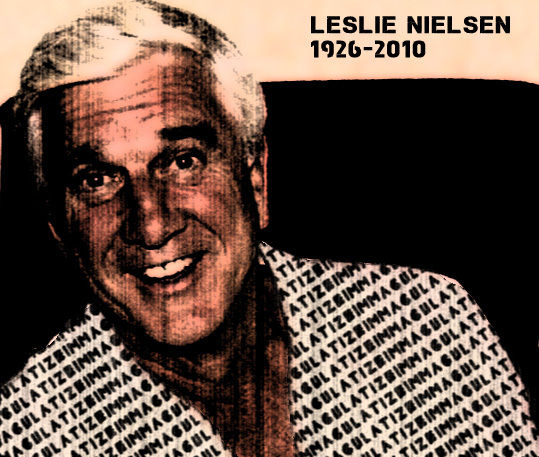 Yesterday’s creative theme was Leslie Nielsen, who died last year and I didn’t even know it. Secondly, here we are, Day 3 almost in the books. Maybe already in the books for some of you international folks. As I’m too lazy to research time zones, I’ll just say good work, my worldly denizens. I’ll keep my personal daily update short: After a restless night’s sleep, my plan to wake up early this morning failed miserably. But I did get some writing done, I did floss my teeth (nearly blood-free! ), and I did hit the treadmill. Productivity wise, I still spent way too much time on email and Facebook. But… No but. Gotta get that nipped in the bud ASAPers. Tried some guided meditating this afternoon which was again very difficult. I’m finding my mind fills with great ideas that I don’t want to forget which adds to the difficulty of clearing my head. Brilliant ideas, like, a “pizza hat” for example. Going Vegan hasn’t been too difficult, but, and I hate to admit this, I decided that honey just wasn’t important enough to me to eliminate. Not that I eat a lot of honey. But it’s in almost every Trader Joe’s boxed soup in my house, and those are an important part of one of my staple meals. I wasn’t going to tell you, but then I realized that no one cares if I consume trace amounts of honey in a vegetable based soup. I’ll research other soups once these have been consumed, PROMISE. Giving back feels good! Seriously! I’ve been talking to Andrew Olivas, a director at LA Union Rescue Mission, a homeless shelter downtown, and they are always looking for new people to come down and help in their weekly food services, as well as other special events. This Saturday they are holding an orientation for folks looking to volunteer there this year. Unfortunately I will be out of town, but for anyone else interested in more information, contact Andrew at aolivas@urm.org. . I believe they have another orientation in a couple weeks which I plan to attend so stay tuned for more info on that. An article about your brain and making resolutions as posted by David in the group. The same David from the quote above! Dude’s on Turbo-Fire. Check what Steve Nash of the Phoenix Suns (a team in the National Basketball Association) eats to stay healthy. Write or make something that involves talking plants. GO! I promise to be more proactive about providing and organizing more activities/excursions for LA peeps next week, but in the meantime I happened upon a great website today which offers a fantastic daily calendar of interesting events called Hidden Los Angeles.